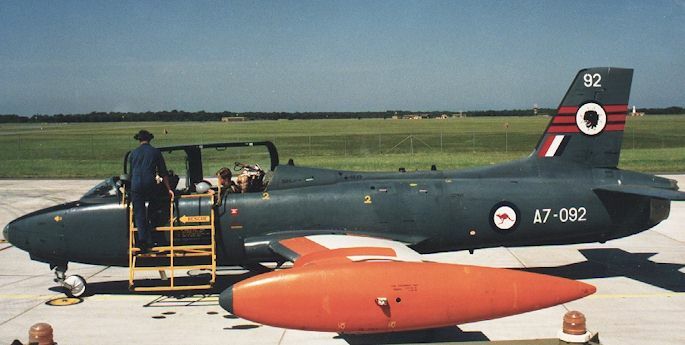 Darren Mottram has spent most of the 1990s working on Macchis with 76 Squadron RAAF at Williamtown in New South Wales. During this period he has accumulated an impressive collection of photographs. Darren has generously agreed to present some of these photographs on HyperScale. 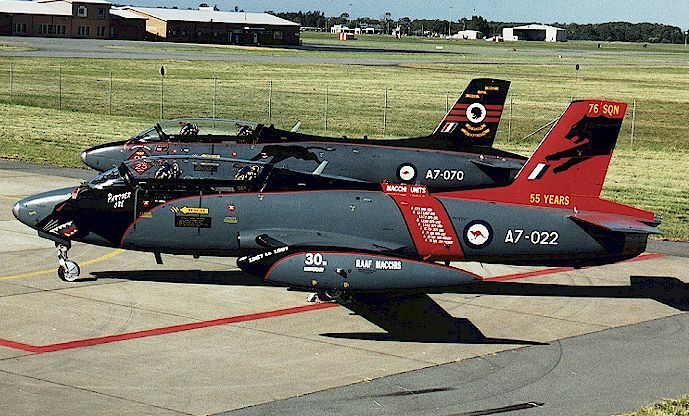 Part One of "Aermacchi MB326H in RAAF Service" is an exhaustive study of the range of camouflage and markings used by 76 Sqn Macchis in the 1990s. 45 thumbnailed photographs have detailed captions which will be a fabulous aid to the modeller. Part Two will be a detailed walkaround. It will also include a review of the Esci kit in 1/48 scale and available accessories. Part Three will cover the Macchi in service with other RAAF Squadrons. Many thanks to Darren for his outstanding effort. Copyright (c) 1998, Darren Motram. All rights reserved. All images by Darren Mottram unless otherwise stated. Material appearing within this document may not be copied, stored or reproduced in any device or publication, in whole or in part, for the purpose of profit without the expressed written consent of the author. 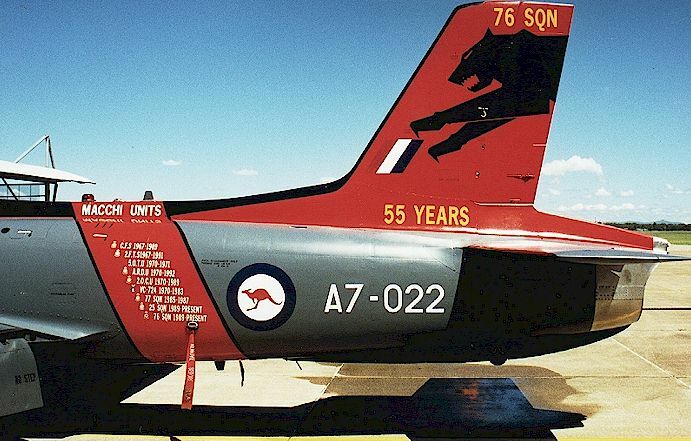 76 Squadron RAAF has a long and distinguished record. It was first formed as a P-40 Kittyhawk squadron in Queensland in March 1942. The Squadron wasted no time and, by July, was on front-line duty in New Guinea as one of the few Allied fighter squadrons available to counter the as yet unchecked Japanese advance south. 76 Squadron's role in the defence of Milne Bay was critical. In September, the Squadron was relieved by 34 and 36 USAAF Squadrons, and embarked for Australia. 76 Squadron was back in the fray again in June 1943, posted to Goodenough Island. It remained in servive at Kiriwina, Momote, Noemfoor, Morotai, Tawitawi and Labuan until the end of the Pacific war. It retained its Kittyhawks (albeit later versions) until this time. During September 1945 76 Squadron was re-equipped with Mustangs. It undertook Occupation duties in Japan until the squadron was disbanded in October 1948. 76 Squadron was re-formed and disbanded on a number of subsequent occasions. 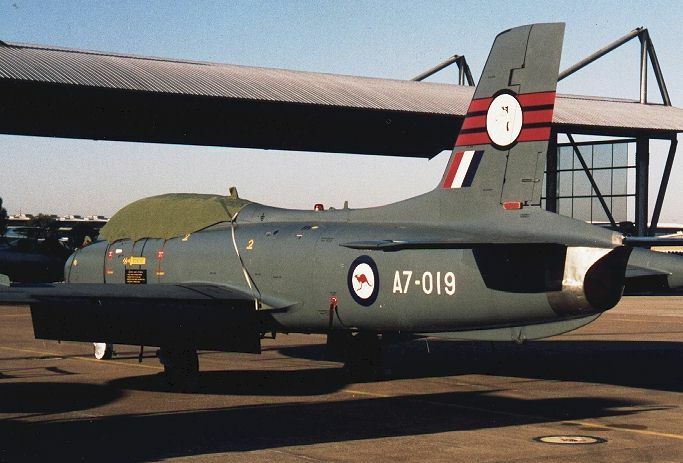 Over a period of over 20 years, 76 Squadron flew Vampires in Malta, the UK and Germany; plus Sabres and Mirages at Williamtown RAAF base back in Australia. 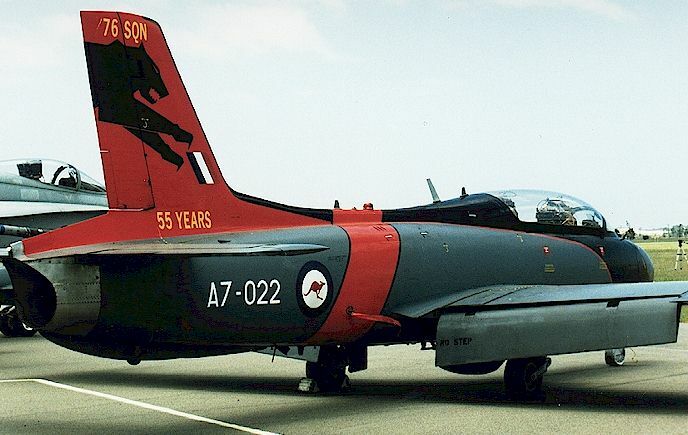 In January 1989, 76 Squadron was reformed again at Williamtown. This time, the Squadron was destined to be equipped with the Winjeel and Macchi MB326H jet trainer performing FAC, fleet and ground support, and fighter conversion training duties. 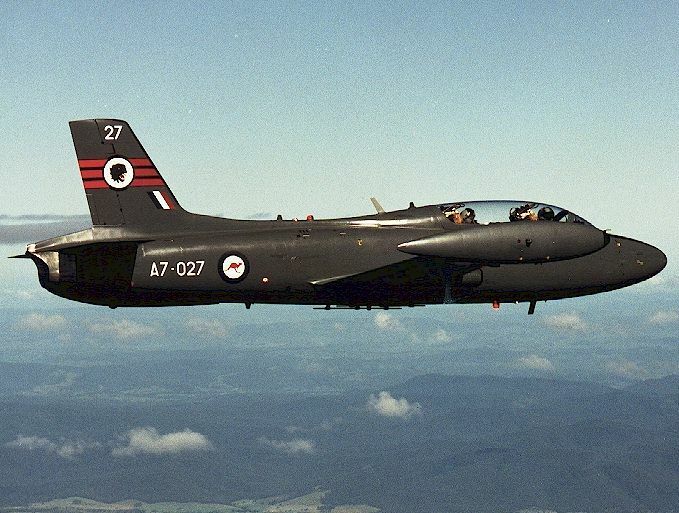 Australia acquired a total of 97 Aermacchi MB326H jet trainers from 1967. These served for many years with the Air Force and the Navy as a primary jet trainer and lead-in jet trainer. 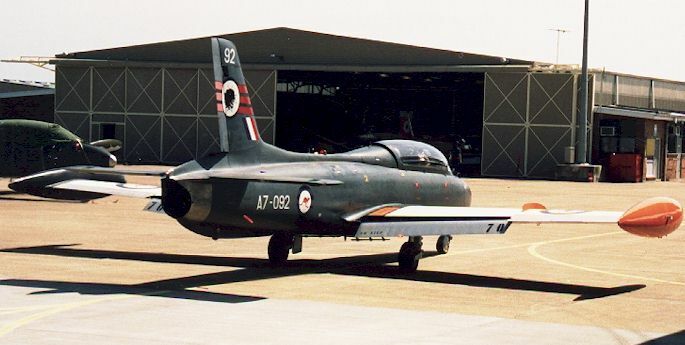 Macchis were operated by units including 2FTS at Pearce, Western Australia; 1FTS (including the Roulettes aerobatic team) at East Sale Victoria; VC724 RAN at Nowra, NSW; plus 5OTU (for a short time); 77 Squadron (for an even shorter time); and 2OCU, all based at Williamtown, NSW. Several aircraft were also on the strength of the Aircraft Research and Development Unit (ARDU) at Edinburgh, South Australia. These were used as flying testbeds, as well as photographic chase planes for other aircraft. 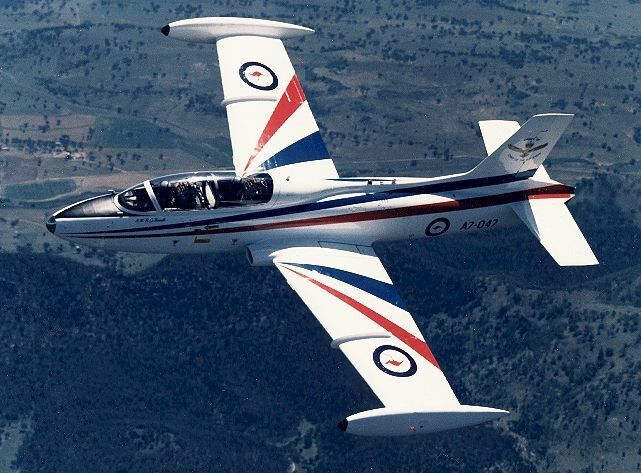 The PC9 was introduced as the RAAF's primary trainer in the late 1980s. This resulted in a progressive reduction in use of the Macchi for this role. However, 2OCU were experiencing an increased workload as a result of pilot conversion to F-18s. 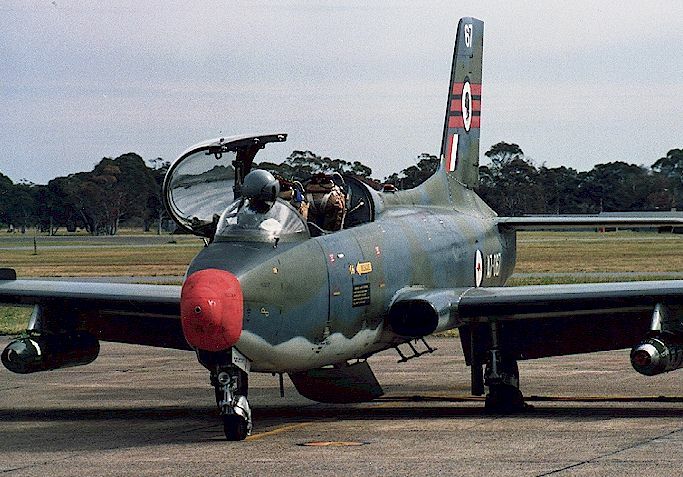 It was therefore decided to re-form 76 Squadron at Williamtown and 25 Squadron at Pearce from the beginning of 1989. The role of 25 Squadron is to convert new pilots to jet aircraft operation in general and the Macchi specifically. 76 Squadron administers an Introductory Fighter Combat course. This course trains pilots destined for F-18 or F-111 squadrons in the basics of jet combat (as well screening out any pilots who may not yet have the required skill levels) before committing them to the "heavy stuff" at an operational unit. 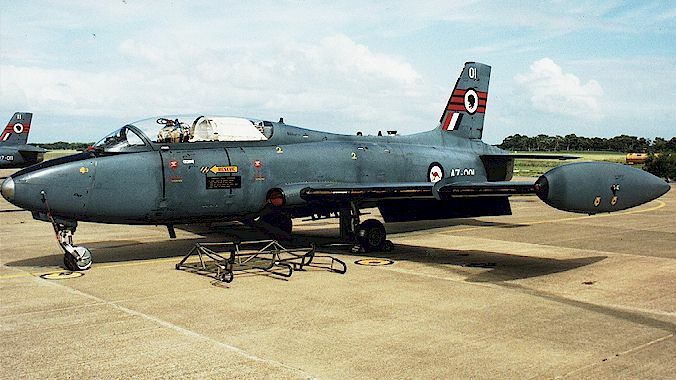 A 76 Squadron aircraft crashed during 1990 due to fatigue problems. A massive investigations into the Macchi fleet's fatigue life resulted, and many airframes were reallocated (and continue to be reallocated) over the following years. This meant that ARDU lost the few remaining airframes it operated to 25 and 76 Squadrons. The Macchi is set to soldier on in Australia until at least mid-2000 when the first BAE Hawks are scheduled to enter service. The Macchi has been covered reasonably well in a modelling sense here in Australia, considering its relative obscurity, with a decal sheet and a couple of 1/48 scale kits by Esci with Australian markings. There is also the excellent book "Vampire, Macchi and Iroquois in Australian Service" by Stewart Wilson. What has not been so well covered is the more recent operation of the Macchi by 76 and 25 Squadrons. I realize that the Macchi will not be everyone's cup-of-tea (some of our overseas friends may not even recognise it!). I hope however, within this article, to not only provide details of the aircraft along with some of the more unusual paint jobs (as well as my own efforts) that I have managed to capture on film over the years for those who are interested, but to also provide an insight from a modellers viewpoint into the many factors and considerations which affect the appearance of an aircraft from day to day for those interested in military aircraft in general as something to bear in mind when consulting the reference for their next model. Remember that any reference (especially photos) is only of a specific subject at a specific point in its existence. Anything outside of this, especially when we start relying on memories and anecdotes for things like colours and patterns, is generalization, and if it can be like this under peacetime conditions, what was it like in combat? At the other end of the scale, there are units and individuals who take (or took) great care in the appearance of their equipment and do keep them spotlessly clean ( American Air national Guard units for example). So the next time someone informs you that your latest pride and joy isn't completely accurate, ask them how much time THEY have spent around the real thing (and hope he doesn't / didn't work on them). As always, happy modelling (it's the whole point of the exercise!). Few people are lucky enough to be able to work at something which is closely related to their hobby, so I appreciate how fortunate I have been, as someone who has always been very interested in military aircraft and modelling them, to be able to work on them as well. I am even luckier in having had the opportunity to design two special colour schemes applied to those aircraft as well. 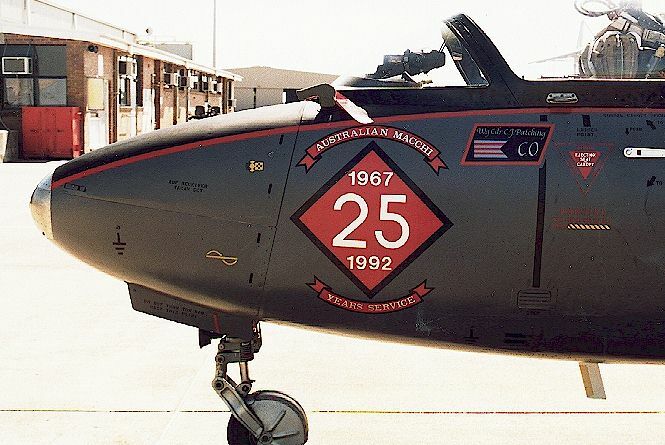 Until recently I have spent the last nine years working on the MB326Hs (Macchis) at 76 Squadron, RAAF Base Williamtown near Newcastle in New South Wales, Australia. During this time I have I have observed (and been involved in) many aspects of operation and maintenance of military aircraft. This has translated into valuable knowledge and a new attitude towards my modelling. The narrowest description I can find for my modelling interests is military aircraft in1/48 scale, with Phantoms and unusual colour schemes playing a large part. 45 photographs are categorised, captioned and thumbnailed below. To view an image at its full size, click on the thumbnail. To return to this page, click the "back" arrow on your browser. 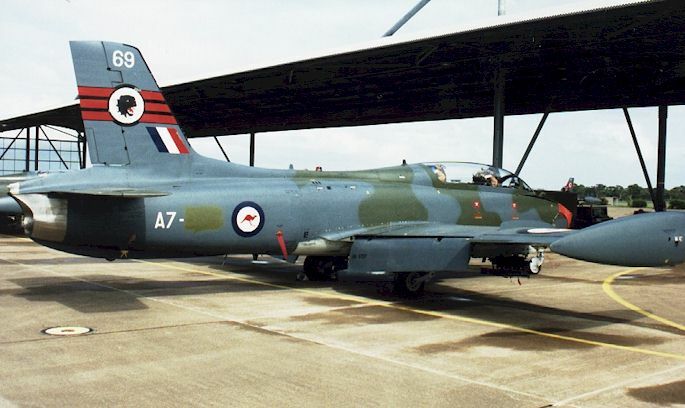 Taken at Williamtown in 1990 (I don't usualy keep specific dates) this shot of A7-86 shows the standard grey and green scheme in which 76sqn first operated their a/c, having inherited them from 2ocu. Taken late in 1997 off the coast of Williamtown, this photo of A7-15 illustrates the standard grey and green scheme from the other side. Note the grey underwing 7.62mm gun pod and the addition of the large blade antenna behind the cockpit. This antenna was fitted to all operational Macchis during 1995-1996. Taken in late 1997 over Williamtown,this photo also illustrates the grey&green scheme but with a better look at the nose. Note the "zaps" under the front canopy. Even though the first all-over grey jets began appearing in 1991, many aircraft were still re-sprayed in this colour scheme when it was their turn, creating a varied fleet and giving rise to many "combination" schemes as various components were swapped between a/c. 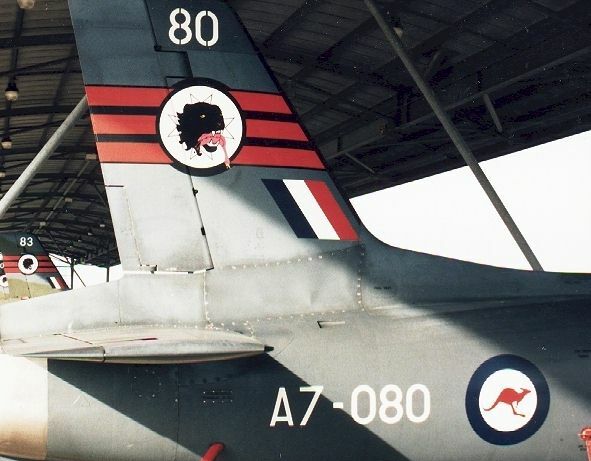 Taken at Williamtown in mid 1998, this is a closeup of the "zaps" on the fwd fuselage of A7-57. They were applied to some a/c during a deployment to Townsville in support of 2ocus Hornet conversion course. They were applied whenever a confirmed "kill" was made against the Hornets on this deployment. Although it may come as a surprise, the Macchi can make life quite difficult for a Hornet (under the right conditions obviously) in a dogfight and the outcome of these encounters was not always in the Hornets favour. The Hornet silhouette on the left originally had a red cross through it and the one on the left a yellow one. (The yellow one signified the "kill of the 2ocu C.O who was actually only an observer on this mission an not taking part.........oops!) Both also originally had the details of the date and pilot written in pen under each but this has faded away long ago. The "Rent-a-Threat" zap reflected our role as "Bad Guys" for the Hornets. 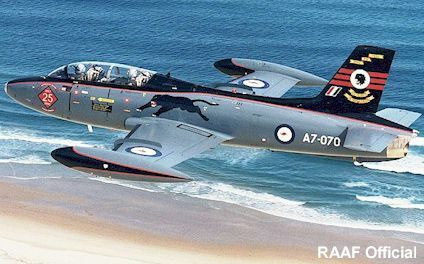 Macchi A7-27, taken off the coast of Newcastle early 1997. This illustrates the overall Dark Sea Grey scheme which first appeared in 1990 on a/c A7-71. All the markings remained the same as on the previous scheme, although these could all differ in detail from a/c to a/c anyway. Also note the high sheen on the a/c. Most a/c have more of a satin finish than matt, this is especially true for freshly painted a/c, and the markings were done in gloss which weathered to a satin finish except the black which was matt. Taken at Williamtown sometime in 1995-95. This is an illustration of what could happen to the finish when it weathered. Note the combination of faded paint and darker areas where maintenance was regularly carried out. Note also the worn leading edges of the wings showing through the orange underneath. All leading edges of wings, intakes,tip tanks, horizontal and vertical tails were coated with an abrasive resistant coating. This coating could be gloss Dark Sea Grey, matt black (an earlier type which started gloss but rapidly ended up looking like black rubber) or gloss black (a later finsh which held it's gloss). To further confuse things, with the frequent swapping of major a/c components, an a/c which was painted with all the leading edges the same could rapidly end up with any combination of finishes. This a/c is also fitted with a blind-flying hood in the rear cockpit for instrument training. A7-23 taken at Williamtown in 19991-92. A few aircraft were not repainted before delivery to 76sqn which led to schemes such as this. 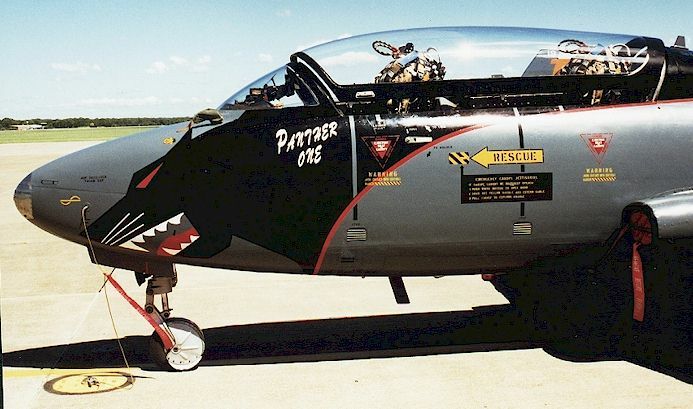 Originally from 2FTS, this a/c has simply had the 2FTS emblem painted out and 76s panthers head applied in it's place. This a/c also has a smaller national flash. Flying surface leading edges a gloss grey. Note also that the fin cap in this scheme is light grey. A closer view of the panthers head as applied to A7-23. A7-005 taken at Williamtown in 1996. On occasion a/c have been swapped between 25 and 76sqns to help distribute the fatigue lives of the remaining airframes. As a friendly rivalry exists between the two sqns there has also been a tendency to "zap" each others a/c. In this case we were to send two of our aircraft over to 25sqn and it was decided that a token of our disdain should be delivered with them. The result was that a pink duck (our interpretation of their Black Swan emblem) was depicted at the mercy of our "savage" black panther. The images were done with a stencil and applied to both sides of the tails of both a/c, reversed as necessary. The "duck" is pink with a yellow beak, red feet and red tongue hanging from it's mouth and details and the cross for the eye are matt black. A7-67 Taken at Williamtown in 1991. This aircraft was painted with a red nose for, wait for it, Red Nose Day. The paint used was a water based distemper applied with thick brushes. As a result the finish was very poor quality. It extended back to the nose gear flipper doors. It was only applied for one flight (on which PR photos were taken) and washed off afterwards. Note the underwing gun pods fitted to the aircraft. The one on the left of picture is painted overall gloss green whilst the one on the right has a natural metal nose (the natural metal was by far the most common finish). The gun pod colours varied over time, being gloss or matt green (a/c cammo colour) or more recently matt grey. The style of application of the stenciling also varied. The pylons also varied between light grey and dark grey, there being a separate fairing around the top of the pylon, creating various mixtures of light and dark grey pylons. A7-19 Taken at Williamtown in 1992. Early-on 76sqn would frequently receive a/c from some of the of the Macchi units as the were closing down. 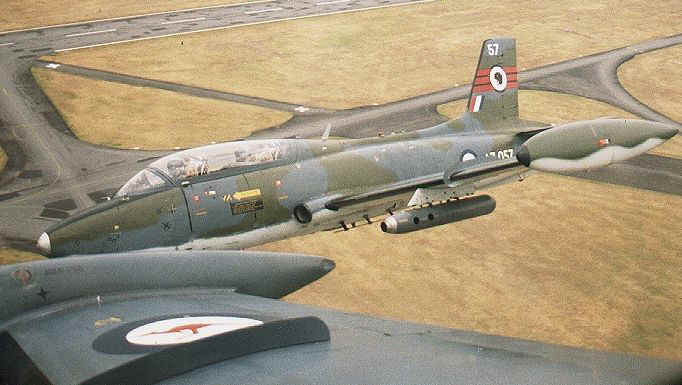 Sometimes the a/c would go through a major servicing at Hawker DeHaviland in Melbourne before transfer to 76sqn. 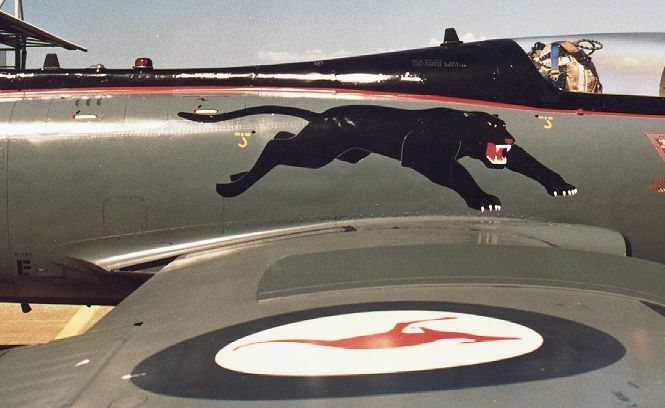 When this was the case the a/c would be painted in full sqn camouflage and markings except for the panthers head on the tail flash, this would be applied at some later date at the unit. 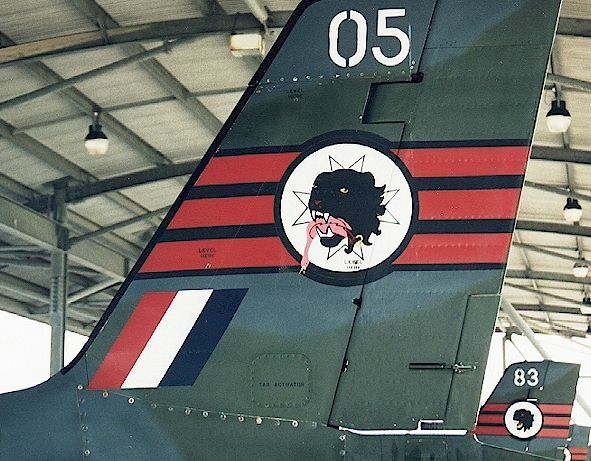 In this case someone had drawn a copy of the cartoon character "The Dog" from the Footrot Flats cartoon strip into the vacant circle on the tail prior to the a/c reaching the sqn. One other possibility is that the a/c was serviced and painted in Perth and, on it's delivery flight, staged through Edinburgh in South Australia. One of the units at this base (492sqn) uses "The Dog" as their unofficial emblem. It may be that the a/c was "zapped" by them. 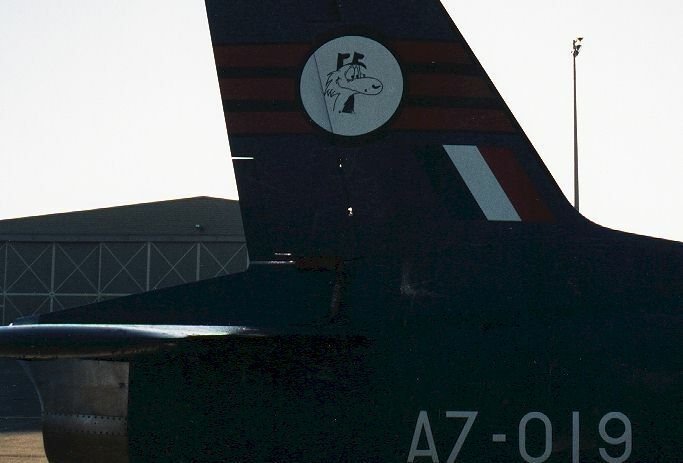 A close-up view of the tail of A7-19. (The photo has been intentionally darkened to try to bring out the image on the tail.) The design was drawn onto a piece of Clear Contact paper which had been applied to the white circle. Another thing to note regarding Macchis is the size of the national tail flash. This varied considerably from a/c to a/c, the one illustrated being one of the larger ones. Note also that this a/c does not yet have it's "last two" digits on the top of the fin. The other side of A7-19. Note that the design is different to that on the other side. Unfortunately both of these images were removed within an hour of these photos being taken. A7-47 taken at Richmond in early 1988. The overall scheme consisting of high gloss Red, White and Blue with the RAAF Eagle and Crown on the tail. This scheme was applied to A7-47 whilst it was being used by the then Chief of Air Staff A.M. R.G.Funnell as a means of visiting the various units under his command. Maintenance markings were applied in a light grey. Note however the repositioning of the ejection seat warning triangles and the use of a different style of rescue and warning markings under the cockpit. Other points of interest are that all the antennae have been painted white, (Although these came in various colours, (gloss or matt grey or gloss or matt black) the smaller blade antennas never came in white), and that all the flying surface leading edges, with the exception of the tip tank, are also finished in gloss white instead of the, then standard, gloss grey. The writing on the tail reads "OFFICE OF CHIEF OF THE AIR STAFF". The a/c did not stay long in this scheme as it was replaced with a PC9 within a year at which time it was returned to the rest of the Macchi fleet (unit unknown). A7-92 taken at Williamtown in 1991.When the fatigue problem with the wings was discovered after the crash of A7-76, there was a massive program of maitenance inspections and fatigue analasys to try and get the fleet operational again. Consequently it was of little importance what airframe the original components came from in order to create a servicable a/c. This led to some interesting colour combinations as seen here. A complete set of wings in the "Fanta Can" scheme with gloss grey leading edges, having been mated to an all-over grey fuselage. A feature woth mentioning here, although not immediately apparent in this photo, are the wing-to-fuselage fairings. There are three fairings per side. From the midpoint of the wing foward there are two, split horizontally at the wing leading edge. From the mid point of the wing aft there is one which fits around the top and bottom surface of the wing. The front fairings being quite wide (about 18in) and the rear one only being about 8in there is a large step between the two when seen from above. All fairings are secured screws and prominent, raised, washers. (as are several other panels and fairings on the a/c.) Quite often these panels would not fit when swapped between a/c so a replacement would have to be found, resulting in further mis-matching of components. Taken shortly after the previous photo as the aircraft departs in it's test flight. This photo clearly illustrates evidence of the wing's original owner, A7-70, by the numbers stencilled on the flaps (a common feature of the "Fanta Can" scheme). Note also that the flaps, ailerons and wing underside are all painted silver in this scheme and that the inner faces of the tip tanks and wing fences are painted matt black. Which part of the aircraft does the serial number belong to!? A7-69 taken at Williamtown in 1996. This a/c illustrates one of the more obvious examples of how far mis-matching could go that I managed to capture on film. As the Macchis age they become more and more prone to fatigue and maintenance related problems. This has resulted in this a/c (the camouflaged front fuselage) being fitted with the overall grey wings from one a/c, the grey aft fuselage from another and a camouflaged horizontal tail from yet another a/c. On top of this the wing-to-fuselage fairings vary from the two forward ones on this side being grey, the aft being camouflaged and all the fairings on the other side are camouflaged as well. Note that the wing leading edges have a rubbery matt black finish which has worn through showing orange underneath. 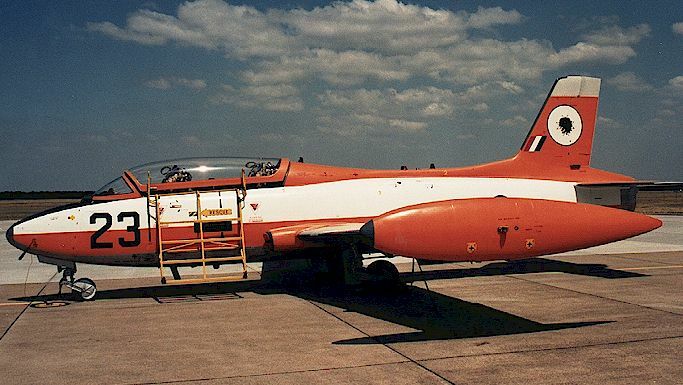 The orange cover on the nose indicates that this a/c is fitted with ordnance (practice bombs). Another photo of the same a/c. Notice how the original serial number of the aft fuselage (A7-035) has been sprayed over with Zinc Chromate undercoat. In reality it was still possible to make out this number under the paint. This a/c was eventually resprayed in the grey and green scheme, although not the front fuselage, which again created a, slightly, mis-matched scheme. A7-70 taken at Williamtown in 1992. Another of the more blatant mis-matches. 70 was originally delivered to 76sqn from the Aircraft Research and Development Unit (ARDU). As their marking was applied to a white tail, this has been sprayed out and the basic 76sqn emblem applied. Notice also the different position and size of the national tail flash. The fuselage has been fitted with all-over grey wings and "Anniversary" tip tanks (although not very obvious in this photo). The wing-root fairings on this side are orange on the front and grey on the rear. The same a/c from the other side. 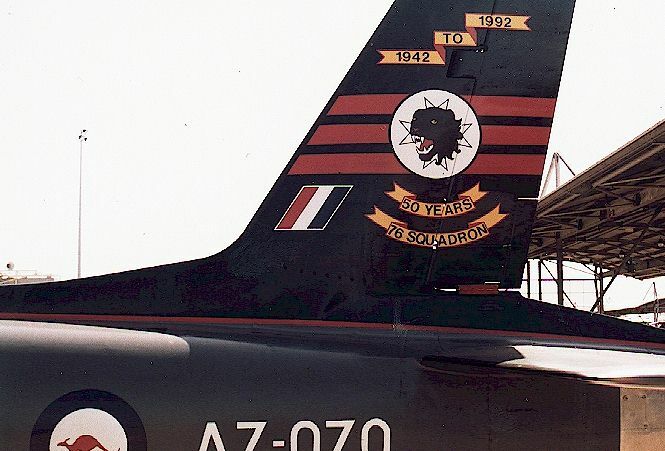 There is a small leaping black panther above the intake and a black 76sqn crest under the wind screen. The wing-root fairings on this side are all grey. This view also gives a better impression of the marking applied to the tail. A bit of useless trivia is that A7-70 was the a/c I used, whilst it was in storage, to draw on and measure up the dimensions for a special scheme which was applied to A7-62. However 62 was grounded (due to the ongoing fatigue investigations) just as the new paint job was finished and never flew in it's new scheme. Instead, as 70 was next in need of a repaint (as per this photo) the special scheme actually "flew" on A7-70 (coincidence or what?). 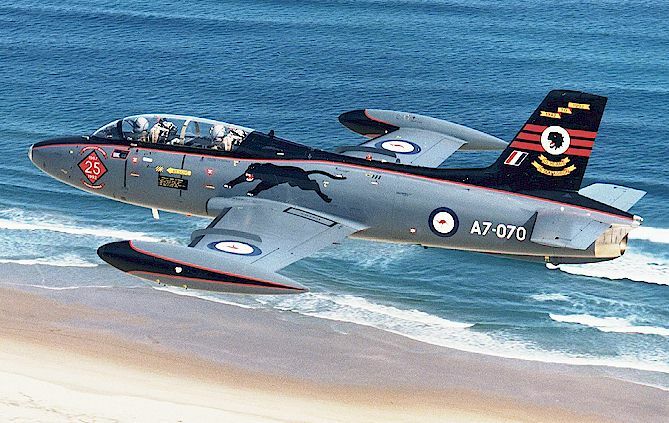 (Photo: RAAF Official) A7-70 taken over Stockton Beach near Newcastle, Australia, with yours truly as back-seat ballast. In 1992 two anniversaries coincided for 76sqn and its a/c. 25 years of Australian Macchi operations and 50 years since the sqns formation in 1942. I personally felt that the significance of the two events (especially with one being half the other) shouldn't be allowed to go unnoticed (having seen, in magazines, the myriad schemes applied to overseas a/c to celebrate, often, less momentous occasions). Australia however, is not well known for special or commemorative colour schemes so I was very surprised that when I approached our Commanding Officer with the idea of a special scheme, he agreed! A7-70 taken over Stockton Beach near Newcastle, Australia, with yours truly as back-seat ballast. In 1992 two anniversaries coincided for 76sqn and its a/c. 25 years of Australian Macchi operations and 50 years since the sqns formation in 1942. I personally felt that the significance of the two events (especially with one being half the other) shouldn't be allowed to go unnoticed (having seen, in magazines, the myriad schemes applied to overseas a/c to celebrate, often, less momentous occasions). Australia however, is not well known for special or commemorative colour schemes so I was very surprised that when I approached our Commanding Officer with the idea of a special scheme, he agreed! As previously mentioned, the scheme was initially applied to A7-62 (with variations) but the a/c never flew in this scheme. I didn't think that another a/c would be painted but A7-70 needed a repaint anyway so it was decided to paint it in this scheme and you can see the results here! I was also extremely fortunate in being allowed to fly in the a/c on the photo sortie. 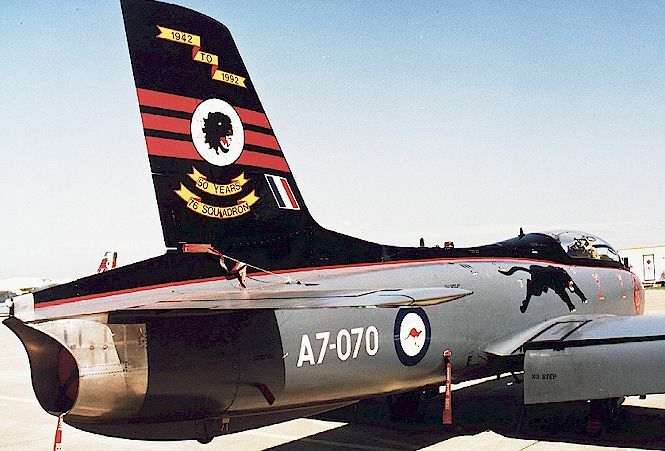 Although most of the aircraft was repainted, the wings were already grey and the tip tanks were from 62 so only the gloss black wing leading edges were redone and the national insignia cleaned up. 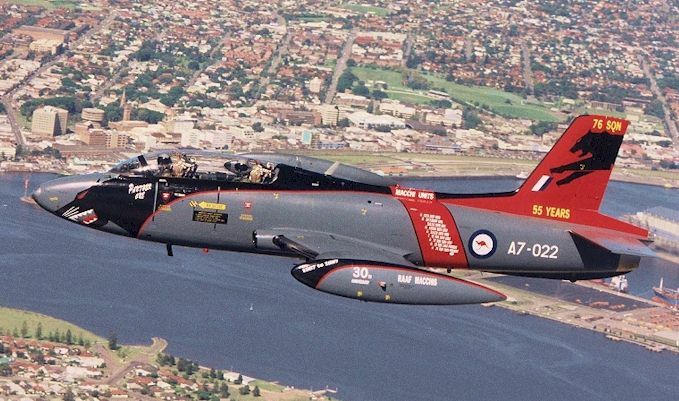 (Photo: RAAF Official) Inverted off Newcastle with yours truly hanging on in the back. This photo provides a rare look at the details and colours of the underside of the aircraft. Notice that the wings have a slightly dirtier appearance to the rest of the aircraft as these were not completely repainted. 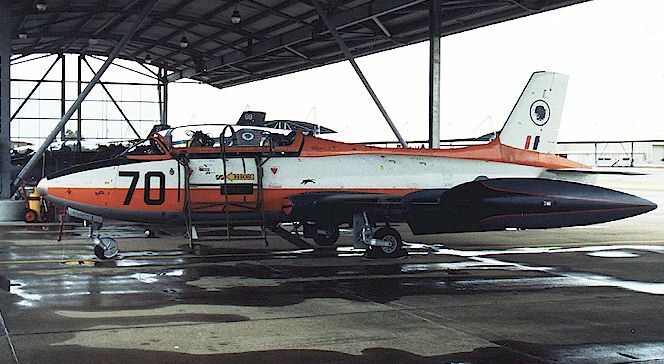 A7-70 taken at Williamtown Civil Airport in 1994 in company with a civilian owned and operated Mig-21 and a Mig-15. Note the smaller national tail flash with a white outline (to help it stand out). 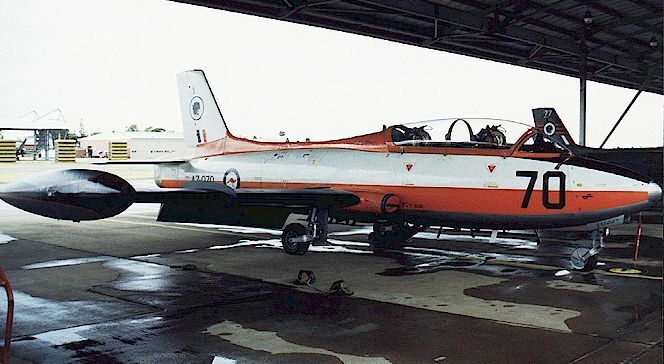 Taken at Townsville, Queensland (notice the "sun shades" applied to the inside of the canopy to try to combat the heat build up) in 1995. Not quite as apparent in this photo is the fact that both ejection seats also have individual protective covers over them to, again, combat the heat. The a/c has by this time been fitted with different wings and intakes, having gloss grey leading edges to both. 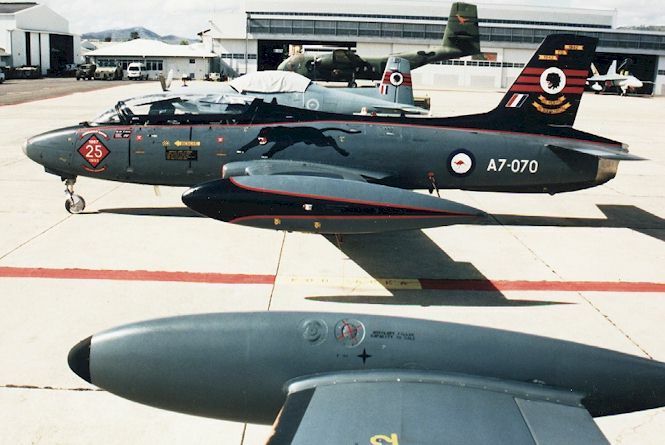 Note the light grey 76sqn PC9 in the background. 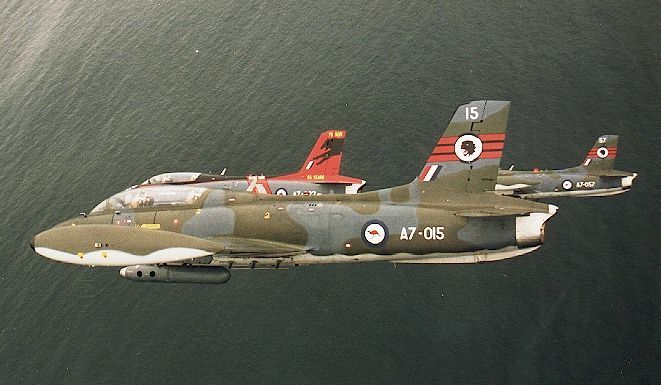 Three such a/c (the other two in dark grey) were operated by 76sqn for the Forward Air Control (FAC) training role after the Winjeels were phased out of service. All three a/c are now operated by 77sqn. Left and right side views of the markings on A7-70s nose. The markings are gloss red with gloss black borders and silver lettering. The pilots name panel is gloss black with gloss red border and reads "Wg Cdr C.J.Patching" in silver lettering with a Wing Commanders Pennant. It is not clear in the photo but the Pennant has dark blue bands top and bottom. Annother thing not immediately obvious in the photos is that the dimensions of the diamond and scrollwork is different on each side (an error on my part during application I'm affraid). The red trim line is applied to the fuselage and the black is the canopy so that when the canopy is open there is only red on the fuselage and the canopy frame is just black. (note on the right hand side that the red is applied accross the canopy hinges). The canopy and windscreen frames are both gloss black but the anti-glare panel is still matt black as on the standard scheme. The device on the inside of the canopy behind the front seat is known as a canopy bow and is used to mount the blind flying hood when fitted. It is mounted on the canopy frame but does not touch any part of the canopy itself. They were fitted and removed very often to suit operational commitments and were definitely not a permanent fixture. Note also the prominent panel lines of the nose section. The entire upper nose cone was removeable to gain access to equipment in the nose (and as a small but handy luggage compartment for overnight essentials on away-base operations). Left and right views of the leaping panther applied to the fuselage. The colours are gloss black, gloss white for claws and teeth, gloss yellow for the eyes and gloss red for the nose and mouth. The upper portion of the mouth is a darker red, a touch of black was added to the standard red to make this colour on the spot during application. The detail lines on the panther are dark grey. Any maintenance stenciling which was applied to the black areas of the scheme was applied in dark grey (fuselage colour). The red stripe remained the same width throughout its length (standard 1in masking tape) and was applied to the vertical sections of the spine and tail. Notice the overall satin finish to the grey. This was not peculiar to this a/c but quite standard for most a/c in either scheme (even with average weathering it remained satin). It is a feature which, for some reason, rarely shows up in photos of a/c but, from personal observation of many types, is actually the state of most military a/c (there are always exceptions, such as the F-18 or the effects of HARSH weathering) but I have come to the conclusion that the tendency to depict military a/c as matt is generally incorrect (even the American F-16s which I got a close look at, at Williamtown, displayed a satin finish similar to this). Another point of interest is that the grey inside the ejection seat warning triangle on the right side is a slightly lighter shade of grey (or matt?). I can't recall how this came about as the entire fuselage was resprayed grey from orange and white (after sanding back and undercoating in zinc chromate). It was common practice however, if the same scheme was being applied over the old one or touch-ups being applied, to simply mask the markings out and spray over them, leaving any old colour (such as dirty or faded grey in the ejection seat warning triangles) visible. 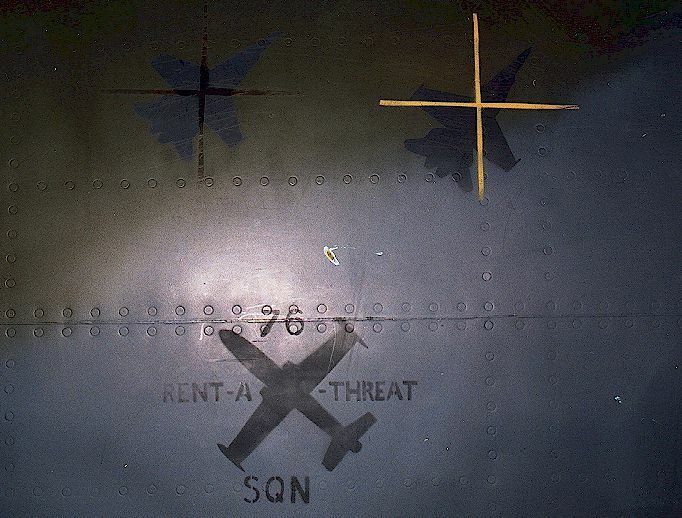 Left and right views of the markings applied to the tail of A7-70. The yellow scroll work and black lettering is bordered and shaded by a narrow (1cm or 1/4in) red outline. The national flash has a white border (the same width as the red on the scrollwork) to help it stand out on the black background. The sqn tail flash applied to this a/c is the same as applied to all 76sqn a/c although you can't see the black border on this jet. The Maltese Cross behind the panthers head is in dark grey. The upper banner (with the dates on it) was positioned like this,instead of rounded like the others, so that ,if it ended up as a decal on a model, it would not have to be applied across the large gap and akward contours of the rudder-balance horn (always thinking of the modeller!). Notice the natural metal panel at the extreme rear of the a/c with the white navigation light (we called it the reversing light). A feature common to all Macchis. Notice also that the fuselage kangaroos on this a/c appear to be slightly "down and forward", although this also varied from a/c to a/c (this would be called out of register if it was a decal!). 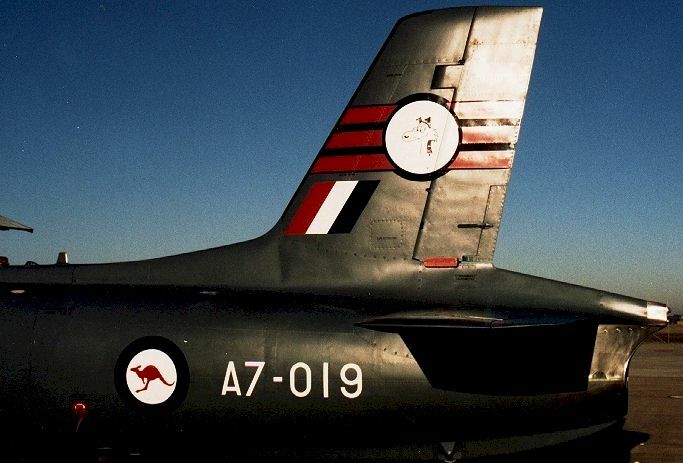 All, full-colour, national insignia applied to RAAF aircraft are done in gloss paints (as is most of the stenciling). Macchis have a control lock in the front cockpit which is always applied, unless the a/c is immediately ready for flight or for maintenance purposes, which locks all control surfaces in a neutral position. The external rudder lock, seen here, is applied at the end of flying for the day to eliminate the minimal movement remaining in the rudder with the cockpit lock on, in case of strong winds. 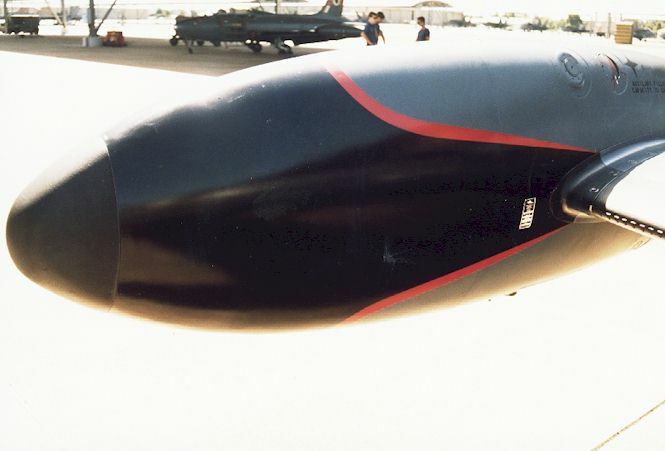 This photo illustrates the way in which the trim applied to the tip tank continued to the inner face and tapered to a point to meet the black of the wing leading edge. The trim on the outer face also tapered to a point at the trailing edge of the tank. The tank on the other side did not have the small data plate visible. The rubber-like texture of the nose-cap of the tank is a good example of one of the anti-abrasive finishes (these nose-caps could be changed around too). Note on the right of the picture the airflow devices on the leading edge of the wing. Referred to as "sharks teeth", these were applied, evenly spaced, from here inboard to the wing fence on all Macchis. 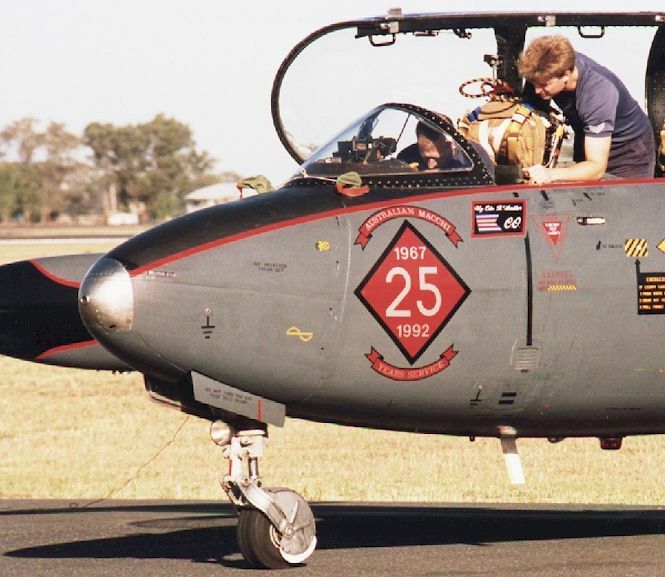 Taken at Coffs Harbour in 1995, this photo illustrates a change in the pilots name plate. It now reads "Wg Cdr R.Ambler C.O." in gloss white and in a different style than before (it's straight off a computer). 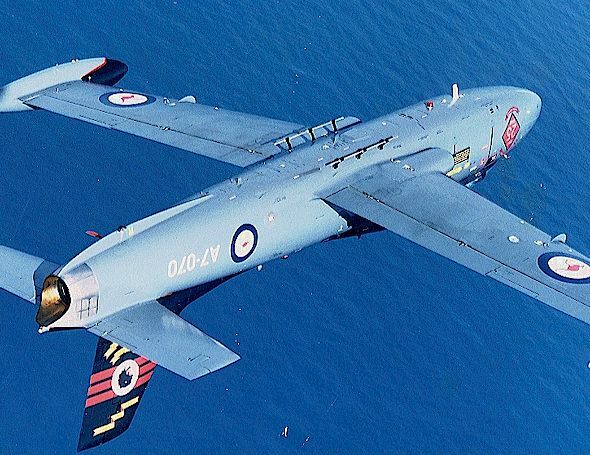 One other name was applied before the a/c lost this version of the colour scheme, that was "Wg Cdr P.Frawley C.O." also in white and in a similar style to the very first version. Note the replacement screws in the windscreen frame. 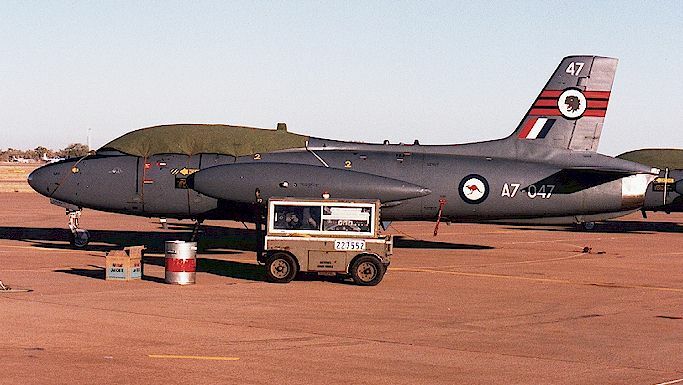 Although not visible in this photo, the a/c has gloss grey leading edges to the wings and intakes as per the photo taken in Townsville (it was the same deployment). I can't honestly recall if the a/c ever had this name with black leading edges or not. Taken at Williamtown in July 1998, this is A7-70 as it appears now. 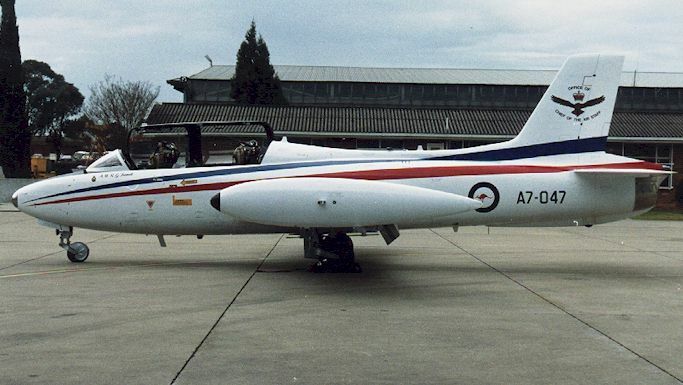 In early 1997 A7-70 went through a periodical major service during which several structural components were replaced (this included a grey rudder with part of a yellow chevron from a 25sqn a/c which earned it the nickname of "yellow finned tuna"). The aircraft was eventually scheduled for a repaint to tidy it up but it could not be spared for the length of time required for a total repaint and it was felt that the anniversary markings were no longer relevant and that they should not be repainted. As a compromise I suggested that the anniversary markings could be painted out and just leave black with red trim as I thought this would provide an equally (or even more) attractive scheme than before (and easier to put on a model too!). The result was as you see it here. when the grey areas were applied it was not to the entire a/c but large, masked out, panels as required, which created patches of paler "clean" grey over the fuselage although these had started to blend in by the time this photo was taken. In this version the a/c has gloss black tank, wing and intake leading edges (although all this may change again as it was scheduled for another major service shortly after this photo was taken. Note that by this time the a/c has had the large blade antenna fitted behind the cockpit and that the "last two" numbers of the serial have been applied to the fin cap. Official RAAF photo. A7-22 taken on the 12Apr97 (again with yours truly as ballast) over Newcastle Harbor, NSW, Australia. In early 1997 a discussion arose pointing out that A7-70 would eventually be due for a major service and, due to expected component replacements, probably end up needing a repaint. Mostly as a joke, I suggested that they could repaint it in a new scheme for the Macchis 30th anniversary. Surprisingly this was taken with interest and, through the efforts of and discussions with several people, came to fruition in the form you see here (obviously a different aircraft was chosen for many, maintenance related, reasons). Although the scheme was not applied in quite the manner originally envisioned (mainly to do with marking placement and size), and therefore, I believe, lost some of its intended appeal, it still offers something different for the modeller or aviation enthusiast in these days of ever expanding grey colour schemes. Notice that this a/c has gloss black tank, wing, intake and tailplane leading edges and how, as seen on the far tip tank, that the tank markings did not extend to the inner face. There is a seam line running down the center top and bottom of the tanks (so don't get to carried away when sanding the join line on your kit) and the markings were applied on the outer face from this seam. Incidentally, this a/c had only a short life in this scheme as it was grounded in early 1998 due to fatigue related problems and used as spares for other a/c. Taken at Williamtown shortly after the flight for the above photo. This photo shows well the writing applied to the tip tank. The dates at the front of the tank read "1967 to 1997". whereas the writing applied to A7-70 for its scheme had been applied by masking and spraying, all the special lettering on this scheme was made of computer-cut adhesive stickers for each letter, each of which needed a coat of sealing varnish around the edge so that it wouldn't peel off in flight (guess who got THAT job!). The red line applied to the tank remained the same width (about 1in) for its entire length, not tapering at either front or rear. For added interest, notice the tail of a/c 19 behind 22. 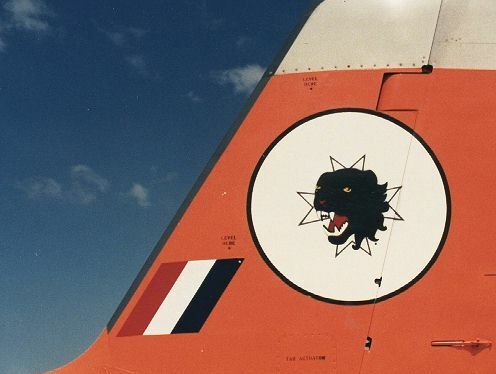 The fin has been replaced with a "new" grey unit with no unit markings whilst the rudder is also a "new" unit but still in orange with a light grey tip, again with no unit markings. This is just a tiny indication of the many variations which have appeared on Macchis over the years. One of the most unusual ones that I can recall was that one aircraft was fitted with one grey wing and one camouflaged wing. This was an EXTREMELY rare occurrence as wings are almost always kept as a matched set. Unfortunately I can't recall the details of the a/c and I didn't capture it on film but I know it did happen. It was often possible to determine which aircraft were arriving overhead by noting the colour combinations of the various parts of the plane (although it seems that I was the only one "nerdy" enough to notice this). 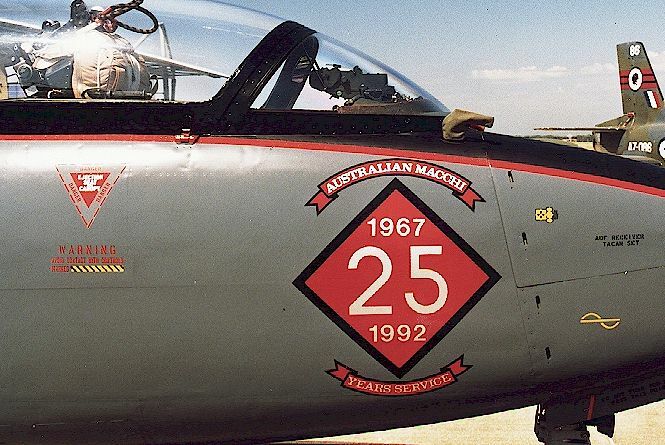 This is a closeup of the mid-fuselage band which carried the list of all the Australian Machhi users to date along with their unit crests (5OTU apparently never had an official crest). It also illustrates the transition between fwd fuselage (black with red trim) and the aft fuselage (red with black leading edge trim). Notice the varying effects and appearance of the different panels and fasteners on the aircraft's skin. A view of the tail showing the design applied there and the gloss black trim blending into the normal leading edge strip on the tail. One of the most obvious things about this scheme the first time you saw it was the vibrancy of the red that was used. It almost had a Day-Glo quality to it (which made it REALLY stand out in the air). I don't know if this effect was from mixing the paint intentionally or just that particular batch of red. You can just make out the difference between this red and the more usual,darker, shade on the national tail flash (which is the shade of red I was originally thinking of when I designed the scheme). The reason you can see the difference between the two is that the tail flash that was already on the a/c was simply masked out and sprayed over (there was supposed to be a white border around it to help it stand out). A view of the other side of A7-22 showing that, although the basic scheme remained the same, the writing on the fuselage band and nose was not repeated on this side. 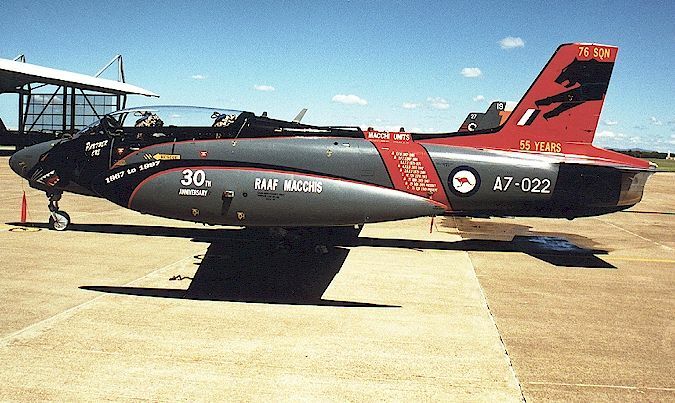 The writing on the tail and tip tanks was repeated and on the tanks read (from rear to front) "RAAF MACCHIS 30th ANNIVERSARY" and "1967 to 1997" in the same style as the other side. The entire red fuselage band and black trim wrapped all the way under the fuselage too. Taken at Williamtown in April of 1992. As A7-70 was approaching it's major service, it's flying hours were becoming fairly controlled so as to get the most out of it before the due time. What this meant, basically, was that in the short time that both 70 and 22 existed in their original colour schemes at the same time (about two to three weeks) they were not being used for the same tasks and so never flew together. Finally the day came that 70 had one day or one flight left before the servicing and it was decided to fly them together, just once, and take photos of them both together. Unfortunately, due to some misunderstandings with a senior Officer (outside the unit) this was prevented and never eventuated. So the opportunity was taken to place the two aircraft together on the tarmac as seen here and photograph them this way instead, this being the only time that these two aircraft were seen together in these schemes.